Plan a romantic getaway or a family vacation to one of the top Colorado destinations including Boulder, Aspen, Denver, Colorado Springs, Fort Collins, Steamboat Springs, Estes Park, Telluride, Durango and Crested Butte. Whether you are looking to get away to the mountains or spend your weekend enjoying attractions in a fun city, there are many family-friendly vacation ideas and romantic getaways in Colorado. The Gant is one of the best romantic getaways for couples who like the flexibility of staying in a luxury condominium hotel located at the base of Aspen Mountain. The resort has two heated outdoor swimming pools, three hot tubs, five tennis courts, barbecue grills and laundry facilities. Summer activities in Aspen include whitewater rafting, fly fishing, golf, horseback riding, jeep tours, hot air balloon rides, parasailing and mountain biking. In the winter, plan a ski trip, snowboarding, snowshoeing, snowmobiling, sleigh rides, snowcat powder tours and ice skating. Choose from one, two, three and four bedroom condominiums with wood-burning fireplaces, private balconies, fully equipped kitchens and daily housekeeping, ideal for a family ski getaway. In the summer, enjoy scenic nature views. 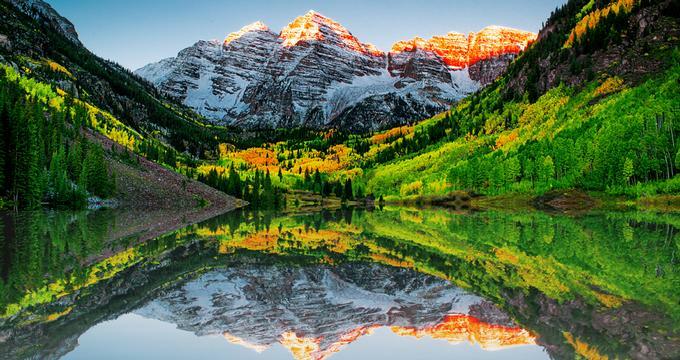 More about The Gant and things to do in Aspen, one of the top Colorado destinations. 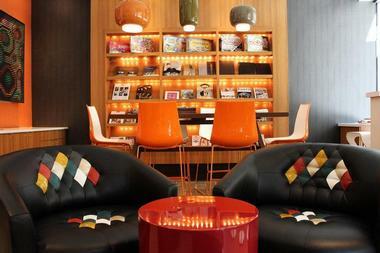 Plan a weekend of pampering and relaxation at St Julien Hotel in downtown Boulder. The hotel features a 10,000-square-foot spa with 12 treatment rooms, and a two-lane infinity pool with a whirlpool and outside terrace. Guests can get in shape at the fitness center with the latest cardiovascular and aerobic equipment. Choose from 201 rooms and suites with luxury bathrooms with soaking tubs and separate glass showers. Ask for a view of the Flatiron Mountains when you book your stay. All rooms offer complimentary Internet access, wired and wireless. The Oxford Hotel in downtown Denver offers vacationers historic accommodations, a great spa, fitness center and a gourmet restaurant. Each room and suite at the hotel is individually furnished, featuring unique touches such as antique headboards and romantic claw foot tubs. Plush amenities include flat-screen HD TVs and Bose radios with an iPod docking station. Stay in touch while traveling by connecting through complimentary high-speed Wi-Fi on your phone, tablet or laptop. The Corner Room is especially romantic, letting you enjoy the view of the street below through floor-to-ceiling windows. The Oxford Club, Spa & Salon offers a full range of services, whether you are looking for a classical massage or a revitalizing facial. Head to the fitness center to work out with a Personal Trainer, practice yoga, take a spinning class or go indoor rowing. The salon at The Oxford is one of the best places in town for a haircut, blowout and highlights. The Urban Farmer Steakhouse by Sage Restaurant Group is scheduled to open in the summer of 2017. Before dinner, have drinks at the Cruise Room Martini Bar decorated in fun Art Deco style. Hotel guests receive complimentary Escalade car service within a two mile radius. Rooms start at USD $200 per night. Next read: 25 Best Things to Do in Denver and 15 Best Romantic Restaurants in Denver, one of the top Colorado destinations. The Leland House and Rochester Hotel are family-owned historic hotels with an authentic Western theme. 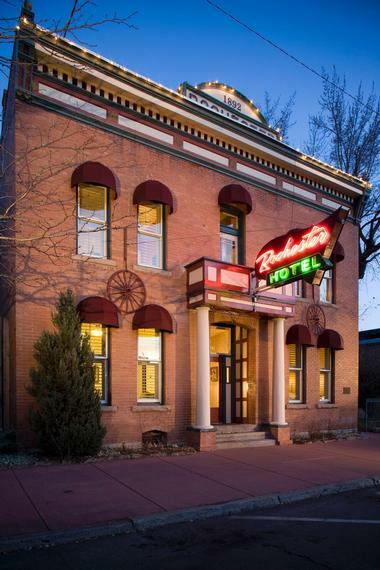 The 14 rooms at the Rochester Hotel are themed after Westerns that were filmed in the Durango area. Each of the 12 accommodations in the Leland House is named after a historic Durangoan and is decorated with that person’s memorabilia, biographies and photos. All rooms have Wi-Fi, cable, Aveda products, complimentary gourmet breakfast and free Cruiser bike rentals. Grab a drink at the Rochester Bar which serves the hotel’s signature Rochester wine. Set on 200 beautiful acres, Blue Lake Ranch Bed & Breakfast near Durango, Colorado, is the perfect getaway for those who want to get away from it all. Take romantic walks through the flower gardens and gaze across the trout-filled lake on your vacation. Guests are accommodated in charming cottages and houses, surrounded by flowers. Room rates start at $139 per night, including a delicious homemade breakfast. The St. Regis Aspen Resort offers five star service, access to ski lifts, shops and restaurants. Relax next to the indoor and outdoor pools, visit the spa and fitness center. If you are planning a winter vacation, ski in the Aspen Highlands Ski Area, Buttermilk, and Snowmass. Each ski resort offers a ski school and skiing for all ability levels. During the summer, the town offers numerous vacation activities for outdoor enthusiasts, including fly fishing, mountain biking, whitewater rafting, and horseback riding. The hotel provides two to four hour backcountry hiking excursions led by experienced guides where guests can admire wildflowers and trees. The 179 guest rooms are furnished in a relaxed Rocky Mountain style, featuring overstuffed leather chairs, suede pillows, wool throws, and leather tabletops. For guests who require additional space, the hotel offers two Presidential suites and 11 One-bedroom suites. The Club Floor, accessible by key-activated elevator, provides guests with additional privacy, complimentary food and beverage presentations, and personal concierge service. The Olives Aspen restaurant, run by Chef Todd English, serves Mediterranean-inspired cuisine with a local flare. The Lobby Lounge features beautiful views, and offers a light menu with cocktails, aperitifs, wines, and beers. Doubles from $725 per night. The hotel is located 10 minutes from the Airport. You can contact the hotel to arrange transportation. Doubles from $725 per night. The hotel is located 10 minutes from the Airport. Hilton Denver Inverness in Englewood is set at the foot of the Rocky Mountains. Located 20 minutes from Denver, the resort is a fun weekend getaway. Hotel activities include golf, tennis, walking and jogging. There is also an indoor and outdoor swimming pool, whirlpools, saunas and massage services. The Golf Course is a 18-hole PGA championship course, open an average of 300 days per year. There are 284 luxury guest rooms and 18 suites. The 32 Club Floor Rooms offer exclusive access to the Mountain View Lounge for continental breakfast, and scenic views of the Rocky Mountains from the top floor of the hotel. The suites have private balconies with a sunken living room. If you want to splurge, the most luxurious suite, the Centennial Suite, has a full kitchen, living area, dining area, private balcony, separate bedroom and an oversized Jacuzzi tub. Choose from five restaurants and lounges. The Swan offers fine dining in an elegant bistro setting, while the Garden Terrace is more casual. The Pub is the place to go to watch televised sporting events and the Golf Grille is conveniently located at the golf course. Take the complimentary shuttle to the Park Meadows Retail Resort for a day of shopping, or drive to Downtown Denver, 20 minutes away. Fly to Denver International Airport which a 30-minute drive away. Weekday rates start at $99 per night. A romantic weekend at the Castle Marne Bed and Breakfast on Capitol Hill in Denver will transport you to more elegant and romantic times with its nine magnificent rooms accented by antique Victorian furniture, fine décor, canopy beds, and fluttering curtains. Of course, they all have modern bathrooms with whirlpool or claw foot bathtubs and other contemporary amenities you simply cannot do without. Stroll through this magnificent historic 1889 mansion and have a hot breakfast at the Peacock Dining Room or afternoon tea in the Victorian Parlor. Take a walk through the mansion’s spectacular gardens and sit on one of the old stone benches to smell the roses before returning to the reality of daily life. The Stanley Hotel is a luxurious hotel in the heart of Estes Park in Colorado that combines a particular style and sophistication with rich colonial charm. Featuring deluxe resort lodging, an exclusive day spa and wellness center, and an array of adventures and activities for the whole family, this hotel is the ideal place for a year-round mountain vacation. Guests can choose from deluxe rooms and suites at the main hotel or accommodations next door at the newly remodeled 40-room boutique hotel called The Lodge. Larger groups and families on longer stays can choose to stay in private, fully-equipped condos overlooking the park, all of which feature spacious living areas, superior facilities, and a complimentary gourmet breakfast each day. Dine in style at one of four restaurants and bars that serve an array of seasonal cuisine, unwind in the exclusive Aspire Spa with an indulgent treatment or massage, and enjoy a range of fantastic outdoor activities throughout the year, including hiking, biking, fishing, horseback riding, skiing, snowboarding, ice skating, and sleighing. Read more about Estes Park, one of the top Colorado destinations. The historic Brown Palace, located in downtown Denver first opened its doors in 1892. Since then, the hotel has accommodated celebrities, presidents and other dignitaries. If you are planning to do a lot of sightseeing on your trip, this unique property is conveniently located within walking distance of the pedestrian 16th Street Mall, the State Capitol, the Denver Center for Performing Arts and and Coors Field Baseball Park. The hotel is built around a central atrium; when in the lobby, you can enjoy soaring ceilings and when going to your room, you'll have a view of the classically furnished lobby below on your city vacation. There is a fitness area, complimentary wireless internet access in the lobby, 24-hour room service, a full-time concierge, twice-daily maid service and overnight valet parking. Choose from 241 guest rooms and suites, some furnished in Victorian style, while others reflect Art-Deco decor. There are five restaurants, ranging from fine dining to casual fare. Room rates start at $ 152 per night on weekends. The boutique Hotel Monaco Denver is a luxury getaway in Denver, decorated with rich colors, custom-designed furnishings and lush materials. 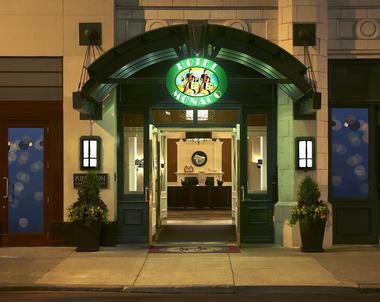 The hotel offers complimentary pet services and amenities such as a doggie mat, in-room bowl and a dog park map. If you decide to leave your favorite pet at home, the hotel can provide you with a complimentary goldfish upon request to keep you company during your stay. There are 189 deluxe guestrooms and suites, all with high-speed Internet access, a coffee maker with Starbucks Coffee, CD player, and a mini-bar. If you are planning a romantic trip, ask for one of the Mediterranean suites which have two-person whirlpool tubs. For the basketball players in the family, Tall Rooms with extra-long beds and heightened showerheads are also available. Panzano is a 210-seat Italian restaurant serving a selection of gourmet dishes. The hotel is located in the heart of Denver's central business district and is within easy walking distance of 16th Street Mall, lower downtown and Larimer Square. Rates start at around $115 per night. Dunton Hot Springs is a luxury hideaway with authentic nineteenth century hand-hewn log cabins and a bath house with natural hot springs in Colorado. Dunton attracts outdoor adventure enthusiasts as well as guests who are looking for a quiet place to relax in natural surroundings. 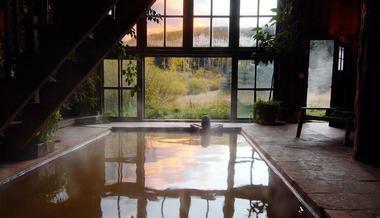 The cabins are located in the San Juan Range of the Colorado Rockies 8,700 feet above sea levels. Guests have access to a two story library and an open-air wedding chapel. Visitors can keep in touch with the outside world through high speed wireless internet access and video conferencing. Spa facilities are quite unique - hot springs are housed in the teepee and bath house, while the massage and yoga rooms are located in the Pony Express Stop. Direct feeds from geothermal springs in some of the guest cabins are even more surprising and a fun adventure honeymoon idea. Spa treatments offered at the spa include wraps, reflexology, Trager Therapy, hot rocks massage and other holistic and therapeutic healing techniques. The resort is situated near the Four Corners and in the midst of two national forests where you can enjoy hiking, climbing, snow-shoeing, back country skiing, heli-skiing and fly fishing on your adventure honeymoon. The saloon serves all meals using organically grown local ingredients, including lamb, fruit and vegetables. Local and international wines complement the meals. Throughout the year, Dunton offers special programs, such as Fly Fishing School, Yoga Retreats and Equestrian Adventure. Ask about special programs and packages when booking. The resort is located one hour from Telluride and Cortez, two hours from Durango, 7 hours from Denver, and 5 hours from Santa Fe, New Mexico. Rates start from $1,100 per night for a cabin, including all meals, non-alcoholic beverages and unlimited use of hot springs. The entire town and its facilities can be rented exclusively for $10,000 per day and can accommodate 34 people. All meals, non alcoholic beverages and unlimited use of the library, screening room, and hot springs are included. Head to Denver, Colorado where you can see shows, visit museums and sample new flavors at gourmet restaurants. The Curtis – a DoubleTree by Hilton is a boutique hotel with 336 innovative accommodations, a retro dining experience and a state-of-the-art fitness center. The Bigger Better Deal Rooms offer 350 square feet of living space and views of downtown Denver. There are three types of suites to choose from: a KISS Suite, a Rolling Stones Suite and a suite dedicated to the Spice Girls. Guests can also stay in a “Hyper Themed” room on each of the 13 themed floors, such as the Jimmy Buffett Suite and the Ghostbusters Suite. All rooms include large desks, 26-inch flat screen TVs, same day laundry and dry cleaning service. Stay fit by working out at the fitness center which is open 24/7. The Corner Office Restaurant + Martini Bar serves a fresh global menu and creative cocktails. The hotel is located across the street from the Denver Performing Arts Complex, a block from the Colorado Convention Center and two blocks from 16th Street Mall. Rooms start at $249 per night. 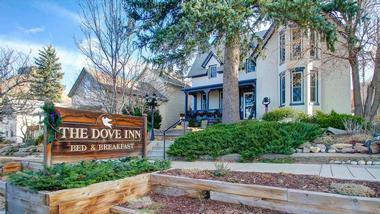 Built in 1866, the historic Dove Inn is a quiet, private bed and breakfast a block from Golden's Main Street that provides an ideal getaway for both business and leisure travelers. The inn offers a choice of luxurious guest rooms to suit every taste from historical accommodations overlooking the inn’s beautiful gardens to luxury rooms for the discerning traveler to multi-purpose rooms for larger families and group travelers. Known as a world-class ski destination, Aspen is beautiful year around and offers activities and attractions for all ages. Skiers can challenge their skills on the magnificent steeps, slopes and glades of Aspen Mountain or Ajax, on rugged Aspen Highlands or enormous Snowmass. Take a 14 minute ride with the Silver Queen Gondola to the top of Ajax Mountain for the spectacular views of the mountain peaks, the city below and tall evergreens all around you. There are bluegrass concerts on Sundays. Every summer, Aspen gets taken over by classic music lovers during the renowned Aspen Music Festival and School with more than 300 concerts. Learn about Aspen from Dean Weiler during one of his popular Aspen Walking Tours and pay respect to John Denver at the John Denver Sanctuary you will pass by while hiking the picturesque Rio Grande Trail. Next read: best Aspen restaurants. A small mining camp not so long ago, Boulder is a modern, sophisticated town at the base of the Flatirons, popular among extreme sports folks and lovers of magnificent nature of all ages. Stroll through the charming downtown with the popular Pearl Street Mall. Discover Boulder’s past at the Boulder History Museum located in the beautiful historic Harbeck-Bergheim House. Boulder Museum of Contemporary Art not only has a range of permanent and temporary exhibits, but also popular educational programs. Located at the foothills of the majestic Rocky Mountains at the elevation of one mile, Denver is a modern, vibrant city with a rich mix of industry, art and history. Explore the city’s bustling downtown with one of the guided Bikalope Tours. Visit the Kirkland Museum of Fine and Decorative Art that includes works of more than 80 internationally recognized architects such as Frank Lloyd Wright. Denver Art Museum has 68,000 art pieces from all over the world and a significant collection of American Indian Art. Try to catch a Colorado Rockies game at their home Coors Baseball Field or a concert of the Colorado Symphony at the Denver Performing Arts Center. Kids will enjoy exploring Denver zoo with its 4,000 animals or playing at the interactive The Children's Museum of Denver. Located on the banks of Fountain Creek and overshadowed by the slopes of Fort Range, Colorado Springs is the city of sports, the place where American Olympians train and where everyone goes out to ski or hike on the weekend. There are 15 trails through the magnificent Garden of the Gods Park with its rugged red rock formations. The highest you can hike is Pikes Peak at 14,115 feet, the highest in the Rockies. With so much great climbing opportunities, Colorado Springs is a great place to learn to rock climb. Front Range Climbing Company and First Ascent Mountain School offer classes for any skill level. Rock Ledge Ranch Historic Site offers a glimpse into the past with the 1860 log cabin and the 1880 farm house. Western Museum of Mining & Industry tells the story of the mining in the area and Cheyenne Mountain Zoo offers a home to more than 950 animals, 30 of them endangered. Home to the Colorado State University, Fort Collins grew around 1864 Fort Collins, a US Army military outpost that is today the historic Fort Collins downtown. Explore the city on the historic Fort Collins Trolley and learn about the culture and history of the people of the Cache La Poudre River Valley at the Fort Collins Museum of Discovery. Explore the nearby great outdoors at the Horsetooth Mountain Open Space or get your adrenaline pumping by rafting on Cache La Poudre River with the Mountain Whitewater Descents Company. Visit Global Village Museum of Arts and Cultures to learn about folk art from all over the world. Take the kids to the Farm at Lee Martinez Park to learn about the farm life and play with baby farm animals. Located in the valley of the Yampa River, Steamboat Springs is world-famous for its fantastic skiing and healing hot springs. With 165 main trails spread across 2,965 acres on the Mount Werner Park Range, Steamboat Ski Resort is one of the largest in the country. Another great winter fun is dog sledding with Grizzle-T Dog Sledding and their Alaskan Huskies. Take a 7.5 mile hike on the Yampa River Core Trail along this picturesque river, and then jump into one of the hot pools at the Strawberry Park Hot Springs. Tread of Pioneers Museum tells the story of Steamboat Springs past and is located in a beautiful Queen Anne-style Victorian house. Take a ride with the Steamboat Scenic Gondola up the slopes of Mount Werner for some spectacular views of the area. Once a small silver and coal mining town, Crested Butte is today one of the world famous ski destinations and the place which claims to have invented mountain biking. Crested Butte Mountain Resort is famous for its excellent slopes, especially for its challenging North Face and Headwall. While the kids are having fun, you might want to visit Montanya Distillers, they make two good rums: Platino Light and Oro Dark Rum. Learn about the history of Crested Butte and Gunnison Valley at the Crested Butte Mountain Heritage Museum, located at Tony’s Conoco, a 1883 former blacksmith shop and a favorite Crested Butte local hangout.